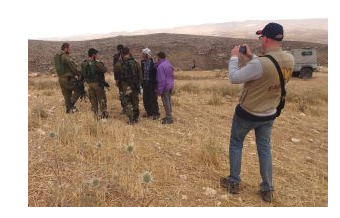 EAPPI, the World Council of Churches’ flagship project on Israel and the Arab-Israel conflict, has brought 1,800 volunteers to the West Bank to “witness life under occupation.” The World Council of Churches does not run similar activities in other conflict zones. By singling out Israel, EAPPI embodies antisemitism, as defined in the International Holocaust Remembrance Association’s working definition. Despite marketing itself as a human rights and protection program, EAPPI places significant emphasis on political advocacy before, during, and after the trip. When volunteers return to their home countries and churches, they engage in anti-Israel advocacy, such as BDS (boycott, divestment, and sanctions) campaigns and comparing Israel to apartheid South Africa and Nazi Germany. Participants are selected by country-specific non-governmental organizations (NGOs) known as “National Coordinators.” The National Coordinators are also active in BDS and other delegitimization campaigns against Israel. EAPPI receives funding from a variety of sources, including the WCC and National Coordinators. Funding from different governments is directed to EAPPI through the National Coordinators and via UNICEF. The significant problems with EAPPI, as laid out in this report, should be seen in light of the antisemitism1 and demonization that emerges from EAPPI’s parent body (World Council of Churches), partners, and affiliated staff. To the donor governments – Act immediately to broadly reevaluate funding to EAPPI, in order to ensure that these funds are not misused to promote antisemitism, BDS, and lawfare, and/or to fuel the conflict. Donor governments must develop and implement transparent funding guidelines that are accountable to the public. To the Israeli government – The Israeli government should develop a consistent, fact-based policy to deal with “delegimization” campaigns, which it defines as a strategic threat. It should engage in critical dialogue with the government donors, as well as with the churches involved with EAPPI. To the WCC– If it desires to improve its image in Israel and with the global Jewish community, the WCC should not promote an ideology that denies Israel’s right to exist as a Jewish State and/or that discriminates against Christian supporters of Israel. Founded in 2002, Ecumenical Accompaniment Programme in Palestine and Israel (EAPPI) is the Geneva-based World Council of Churches’ (WCC) “flagship project” on the Arab-Israeli conflict. 2 EAPPI’s stated mission is to “witness life under occupation, engage with local Palestinians and Israelis pursuing a just peace, to change the international community’s involvement in the conflict, urging them to act against injustice in the region.” The program brings international activists, referred to as “Ecumenical Accompaniers” (EAs), to the West Bank; the EAs apparently enter Israel with tourist visas. In the past 15 years, EAPPI has brought 1,800 EA volunteers on the program. Upon first arriving in Israel, EAs are “provided with a training of about 10 days in Jerusalem prior to their placement.” These Jerusalem-based sessions include “training for advocacy upon returning to home country.” After, activists are placed in “East Jerusalem, Qalqylya/Tulkarem, Jericho, South Hebron Hills, Hebron, Bethlehem and Yannoun.” EAs are also located at checkpoints, and points of friction between Israelis and Palestinians and between Palestinians and the IDF – including in the Old City of Jerusalem. EAPPI’s “extensive advocacy” includes sharing “first-hand experiences to open the eyes of their communities, churches and governments to the realities of occupation.” According to EAPPI, advocacy includes both work in Israel “and back in our home countries…Advocacy is the tool for increasing international action for change. We share eyewitness testimonies with faith leaders, decision makers, media, civil society, and business officials, so that they change public policy…Increased international awareness increases pressure on the perpetrators of human rights abuses and helps protect civilians from these abuses” (emphasis added). Accordingly, many EAs participate and lead BDS (boycott, divestment, and sanctions) campaigns against Israel upon their return to their home countries. Furthermore, top WCC officials have denied the ties of modern Israel to Jewish history in the land of Israel and have compared Israel to apartheid South Africa and Nazi Germany. On June 20, 2017, at the “Bethlehem Consultation on 50 Years of Occupation,” the WCC’s general secretary Dr. Olav Fykse Tveit stated, “I heard about the occupation of my country during the five years of World War II as the story of my parents. Now I see and hear the stories of 50 years of occupation…” (emphasis added). This type of language falls within the definition of antisemitism issued by the International Holocaust Remembrance Alliance and adopted by the European Parliament on June 1, 2017. 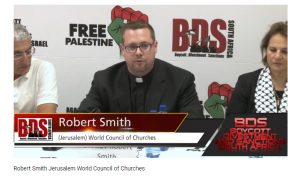 At an August 2015 “Israel: Palestinian Christian Perspective” conference, promoted by the BDS Movement, WCC’s co-moderator of PIEF (see below) Robert Smith stated, “Christian theology that support Zionism is heresy… Such Christian theology that support Zionism is a false teaching that must be confronted…it is essential for all of us to understand that the Israel of the bible the ancient Israelites are not link in any substantive or material way to the contemporary modern state of Israel…the Israeli society is full with racism and light skin privilege…” (emphasis added). 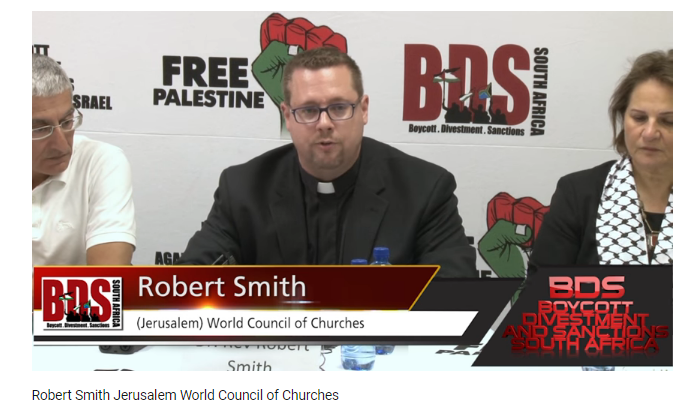 In addition, on Sep 15, 2016, Tveit and Jim Winkler (National Council of the Churches of Christ in the USA), issued a statement arguing that “we see parallels between the crisis in Israel and Palestine and the struggles for racial justice in the United States and the anti-apartheid struggle in South Africa…One cannot keep an entire people subject to pressure and violence for many years and not expect a violent reaction. We do not endorse violence, but we know people are losing hope and faith in the efficacy of nonviolent means” (emphasis added). WCC’s Co-moderator of PIEF Robert Smith speaks at a BDS conference in South Africa. Coordination of the WCC-EAPPI program is carried out by a team in Geneva under the WCC’s “Peacebuilding section of the Public Witness and Diakonia programmatic area,” headed by Rev. Dr. Owe Boersma.6 Recruiting, training, and advocacy coordination are done by 22 country specific church-based frameworks, known as “National Coordinators.” For instance, in the UK and Ireland, EAPPI is administered by the Quakers in Britain on behalf of 16 partner organizations, which include church groups and NGOs such as CAFOD, Christian Aid, Pax Christi UK, and Trocaire; in Denmark, EAPPI is administered by DanChurchAid; in Norway by Norwegian Church Aid; in Switzerland by HEKS EPER and Peace Watch Switzerland; and in Netherlands by Kerk in Actie. Some National Coordinators’ grantees and partners are involved in political campaigns against Israel (see below). Dr. Zoughbi Zoughbi, founder and director of the political NGO W’iam, serves as EAPPI’s Secretary and interim Local Programme Coordinator. In 2017, WCC allocated $1.3 million to EAPPI. Of this, $803,000 was spent on Ecumenical Accompaniers from Austria, Australia, Germany, Switzerland, Denmark, the UK, Ireland, Norway, Sweden, Finland, and the US, and in partnership with UN bodies. The Swiss church NGO HEKS provided CHF 300,000 in 2018 and CHF 225,000 to EAPPI in 2016. In 2015, 24% of HEK’s funding came from government sources in Switzerland. According to UNOCHA, it appears that in 2018 HEKS provided $56,615 to ACT Alliance / Dan Church Aid – Norwegian Church Aid Joint office in Palestine for an EAPPI project. In 2017, the British church NGO CAFOD granted £25,000 in 2018 and £30,000 in 2017 to Quaker Peace and Social Witness for use by EAPPI (see below). In 2015-2016, CAFOD received funding from the EU, UK, and Ireland. In 2017-2019, EAPPI will receive $328,995 from DanChurchAid (Denmark) and in 2014-2016, it received $281,451. DanChurchAid receives funding from Denmark and the EU. In 2018, ACT Alliance / Diakonie Austria provided $10,112, ACT Alliance / Finn Church Aid provided $97,638, ACT Alliance / Norwegian Church Aid provided $64, 038, and ACT Alliance / United Church of Canada provided $7,464 to ACT Alliance / Dan Church Aid – Norwegian Church Aid Joint office in Palestine for an EAPPI project. Research also shows funding for EAPPI that is external to WCC, with a significant portion originating with or being channeled to National Coordinators. The extent to which this funding is reflected in WCC’s financial documents is unknown. EAPPI is considered to be the “main project” of Norwegian Church Aid’s (NCA) “Faith Communities and Peace Building program in Israel-Palestine.”8 This NCA program is funded by the Norwegian Ministry of Foreign Affairs and its Section for Humanitarian Affairs. In 2017-2018, the Norwegian Ministry of Foreign Affairs provided NOK 4,052,534 to NCA for EAPPI. From 2011-2015, Norway provided NOK 13.7 million to EAPPI and its partner Rabbis for Human Rights. Support to WCC “plus funding for EAPPI” in 2015 was NOK 2.6 million. In addition, according to UN-OCHA’s reporting system, in 2015 the Norwegian government granted $287,323 via Save the Children to several organizations and implementing partners, including EAPPI, as well as YMCA, Ma’an Development Center, and the Palestinian Center for Democracy and Conflict Resolution (PCDCR). The Swedish Mission Council Humanitarian Framework, which is a recipient of Swedish government funding, states that EAPPI will receive SEK 6 million per year in2017-2019 (totaling SEK 18 million). In 2013-2015, the Swedish government (Swedish International Development Cooperation Agency) transferred $2.5 million to the Swedish Council of Churches for EAPPI ($711,803 in 2015; $874,648 in 2014; $921,206 in 2013). “Bread for the World supports this EAPPI program with ecclesiastical funds, with a contribution to the shared costs of the Geneva office and the cost of preparing and posting 10-15 volunteers from Germany.” Bread for the World receives extensive funding from the German government. In 2013, Finland granted $222,673 to the “Swedish Ecumenical Accompaniment Programme in Palestine and Israel (via FEAPPI/Finn Church Aid). In 2016–2017, EAPPI and Christian Peacemaker Teams (CPT) received $751,853 for implementing UNICEF’s “safe schools” UNICEF project. According to UN-OCHA, in 2015, Canada provided UNICEF with $790,514 for a project implemented by EAPPI and Christian Peacemaker Teams (CPT, see below). 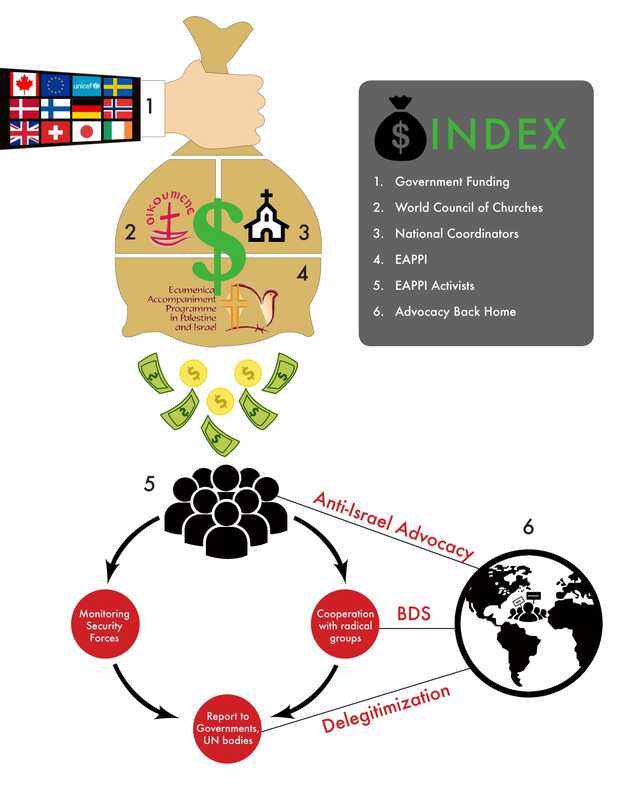 NGO Monitor research has identified numerous activities and statements by EAs and other EAPPI affiliates that demonstrate their support and involvement in activities that delegitimize Israel. Ecumenical Accompaniers (EAs) have made numerous inflammatory and factually inaccurate statements, both during and following their participation in EAPPI. Blogs, presentations, public statements, and social media make these proclamations available to the public. An EAPPI-Switzerland blog featured an interview with Manal Tamimi (June 10, 2017). Manal Tamimi frequently utilizes antisemitic and violent rhetoric and imagery on social media. For example, on August 1, 2015, Tamimi tweeted, “I do hate Israel ,i (sic) wish a thrid Intefada (sic) coming soon and people rais (sic) up and kills all these zionist settlers everywhere.” In September 2015, on Yom Kippur (a fast day and the holiest day of the year in the Jewish calendar), Tamimi tweeted:“Vampire zionist celebrating their Kebore day by drinking Palestinian bloods, yes our blood is pure & delicious but it will kill u at the end” The UN removed Tamimi from a report listing her as a “human rights defender”, after NGO Monitor filed a complaint documenting her antisemitic and violent tweets. In 2016 in South Africa, EAPPI activists participated in Apartheid Week events in Pretoria and in 2017 at Nelson Mandela University. 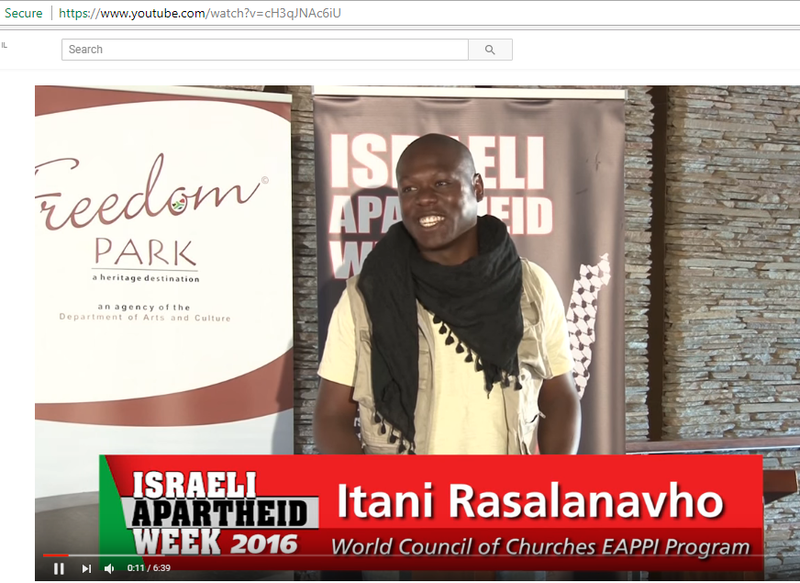 BDS South Africa’s website also stated that a leading EAPPI activist participated in its Apartheid Week events. A South African EA who participated in the program twice advocated for crippling the Israeli banking system, calling for “SWIFT [Society for Worldwide Interbank Telecommunication] sanctions against Israel.” He stated that, “If we can develop the momentum of sanctions against Israeli banks then all the power of the Israeli military becomes irrelevant…that’s really the basis to support the BDS program…without access to SWIFT….the whole economy would quickly collapse…the time has come to say that the victims of the Holocaust have now become the perpetrators” (emphasis added). An Austrian EA, Irene Benitez, is quoted in an article on the Austrian sending organization Diakonie’s website. In the article about EAPPI’s program, Irene accuses the IDF and Israeli civilians of “regularly” carrying out “attacks” against “the Palestinian population.” (NGO Monitor translation from original German). Diakonie concluded that “Benitez, like her colleagues before, will contribute to the enlightenment in Austria regarding the tense situation in Palestine. She is planning lectures in parishes, schools and congregations and is available for interviews, which we are happy to provide.” (NGO Monitor translation from original German). On June 18, 2017, an EA from England (who participated in EAPPI from April to July 2016) gave a presentation “EYE-WITNESS – Stories from the West Bank & Israel” at a church in Liverpool. The EA discussed the “Bedouin community called Jabel ababa” and claimed that the “Israeli government is trying to force a relocation plan on all Bedouin communities and to make them move into townships… does that ring a bell somewhere back to South Africa? Strongly reminds me of what the British did to the Aboriginals some 200 years ago, and what about what happened to the native Indians in the USA at around the same time…” According to statistics only 2% of Palestinians support violence as part of the solution to the conflict …” He added that “the Israeli government is set on not allowing any greater proportion of Palestinians that already exist, Arab-Israelis or Palestinians, so they can’t be more then, currently there are about 39 percent of the total population but Israel wants that figure to be 30 so that is one of the reasons for house demolitions… and often when Arab Israeli are punished, how are they punished? They can either be sent to the West Bank to get them out of Israel or worse sometimes they are sent to Gaza…“ (06:40, 09:00, 01:05:30). An EA from the US stated in a presentation that he participated in a “journey along the Palestinian via Delarosa called the Contemporary Way of the Cross…at each station of the cross we reflected on the continuing suffering of the Palestinian people and linked it with the original events of Good Friday during another occupation two thousand years ago…” (38:13-38:46, emphasis added). The EA also promoted BDS campaigns against Israel, proclaiming that “Soda Stream is very popular in the United States… if you would like to support the Soda Stream boycott, I have some cards…and this afternoon I’m going to be joining Jewish Voice for Peace for their monthly boycott… (36:00-37:00, emphasis added). On March 3, 2018, a group of EAs met with the head of the Palestinian NGO Ma’anDevelopment Center, Saami Khader, and Ma’an activist Hamza Zbeidat, as well as an individual from the Norwegian Representatives Office in Ramallah. As identified in the Daily Telegraph, Zbeidat is a member of the PFLP terror group. Another Ma’an employee, Ahmad Abdallah Aladini, was referred to by the PFLP as a “comrade” after being killed in the violence along the Gaza border in May 2018. In April 2013, a group of EAs participated in a tour of Jerusalem with Mohammed and Ali Jiddah. Mahmoud Jiddah, reportedly a “PFLP member,” and his cousin Ali Jiddah were imprisoned by Israel for 17 years for carrying out grenade attacks against Israeli civilians in Jerusalem in 1968. EAPPI’s National Coordinators are also active in anti-Israel advocacy, with some funding fringe NGOs involved in BDS and lawfare campaigns against Israel. For instance, In South Africa, EAPPI National Coordinator Dudu Mahlangu-Masango is signatory to a November 2012 letter to President Zuma that states, “Some Gazans are involved in shooting home-made ‘rockets’ into Israel, and while we disapprove of this, it is a reaction of an oppressed people to the much greater violence inflicted on the people of Gaza by Israel and also in response to Israel’s ongoing and systematic violence against the Palestinian people…our government should give Israel an ultimatum: if one more civilian is killed, the Israeli ambassador will be sent back to Israel and our ambassador will be recalled…We also call on our government and civil society to instigate broad-based boycott, divestment and sanctions (BDS) on Israel” (emphasis added). On May 15, 2018, during a television interview, when asked whether she thinks that South Africa should break diplomatic relations with Israel completely, Dudu Masango-Mahlangu answered “Coming from South Africa Apartheid system…that’s what they are doing was wrong they had to be sanctioned, so yes I agree, a total sanctions between South Africa and Israel I think will be the way out…” Regarding the violence along the Gaza border that began in March 2018, she stated “How do you kill with a sniper and people have nothing in their hand even if they had stones, yes some of them they do come to the point of throwing stones but a stone to a live ammunition…do Palestinian have any arms with them…the only people who have guns… who have sniper shots are Israeli soldiers, the Palestinian what you are looking at they are going forward with stones yes it’s a stone we can see it as a violent thing but it’s a stone compared to a sniper shot…” (emphasis added). Masango-Mahlangu furthered “What is happening in Palestine is far worse then what used to happen back here at home…”(4:45 – 12:15, emphasis added). The United Church of Canada (UCC) is EAPPI’s sending organization in Canada. UCC supports boycott campaigns of Israeli products made in the settlements and East Jerusalem. In September 2017, Jan McIntyre, an EA, spoke at the United Network for Justice and Peace in Palestine and Israel (UNJPPI) annual conference – membership in UNJPPI includes being “adherents of the United Church of Canada.” In an October 2015 post in her blog, Jan wrote, “The 48 year Israeli occupation (illegal according to International Humanitarian Law) of Palestine, with even greater repression of human rights over the last several months, has led some young Palestinians to respond violently. Frustrated and desperate, and prohibited from carrying guns, they have resorted to the use of knives as a tool to stab Israeli soldiers and citizens” (emphasis added). 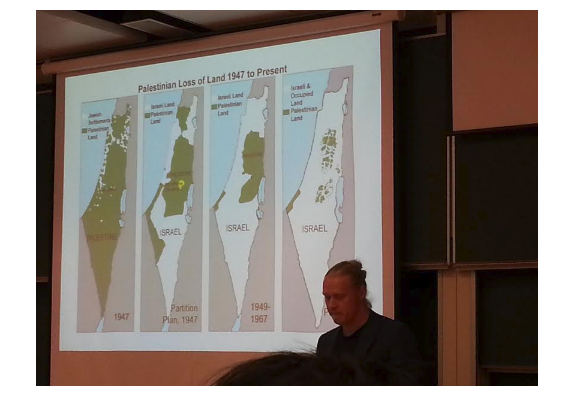 In Finland in 2014, EAPPI and Finn Church Aid traveled to major university campuses alleging that Israel victimizes and discriminates against the Palestinian population and “vindictively persecutes” Palestinian children. ICHAD Finn also promoted the tour. In Sweden, EAPPI is organized, in part, by the Swedish Council of Churches along with a steering committee. The steering committee includes “representatives from Diakonia and Sabeel Scandinavia… [and] the Swedish part of the program is funded by Sida funds.” Sabeel supports a “one state solution,” meaning the elimination of Israel as a Jewish state, and applies “liberation theology,” claiming that Palestinians represent a modern-day version of Jesus’ suffering. This includes deicide imagery and supercessionist rhetoric used to demonize Israel and Judaism. In the US, EAs are selected to participate in EAPPI through EAPPI-US. In partnership with Church World Service, EAPPI-US is supported by US national churches including Christian Church (Disciples of Christ), Episcopal Church, Evangelical Lutheran Church in America, Presbyterian Church, United Church of Christ, and United Methodist Church. Additionally, Global Ministries is one of the National Coordinators of EAPPI in the US and donations to EAPPI-US are provided via Global Ministries. On May 18, 2018, the co-executive of Global Ministries, Rev. James Moos, published a letter “The ongoing Nakba” stating that “May 15 is known to Palestinians as Nakba (‘catastrophe’) Day; it comes the day after Israelis celebrate their Independence Day. This year will mark 70 years since the state of Israel was created and 750,000 Palestinians were displaced and dispossessed, resulting in a Palestinian diaspora and refugee population that now numbers over 5 million” (emphasis added). On April 12, 2018 Global Ministries published a letter ”Right of Refugees, Right to Demonstrate Peacefully, Right to Dignity” signed by all churches that support EAPPI-US. The letter states that “More than 1.3 million of Gaza’s nearly 2 million people are refugees. The Gaza demonstrations are an assertion of Palestinian rights…Palestinian refugees have the right to return to their homes, and to compensation for loss of property, as laid out in UN General Assembly resolution 194…We call upon the United States…to censure the violent and indiscriminate actions of the State of Israel in response to the demonstrations which in no way threaten the security of the state or its citizens, and to hold Israel appropriately accountable, ensuring that US aid isn’t used in ways that contravene established US and international laws, given the more than $3 billion in military aid the US disburses to Israel annually” (emphasis added). The BDS organizations American Friends Service Committee (AFSC) and Pax Christi also signed. Since 2007, EAPPI has participated in the Protection Cluster Working Group (PCWG) and the Settler Violence Core Group (SVCG) – both UN participatory forums are comprised of UN agencies as well as local and international NGOs in the West Bank and Gaza. According to UNOCHA, “It’s the main inter-agency forum in the oPt for the collaboration and overall coordination of activities supporting protection in humanitarian action. Members of the PCWG meet periodically – once a month – to discuss issues of concern.” EAPPI’s role in these groups is “ongoing submission[s] of incident reports to the SVCG, UN agencies and other relevant actors. Participation in meetings of the Silwan Task Force/East Jerusalem Task force and AIDA, and the Education Cluster.”10 As noted, EAs “monitor for human rights violations and do a lot of administrative work which is fed into UN systems” (emphasis added). Under the UNICEF Working Group framework (see NGO Monitor’s report “UNICEF and its NGO Working Group”) EAPPI is responsible for monitoring and reporting on alleged instances of violations related to education. However, as detailed in NGO Monitor’s report, EAPPI volunteers lack the requisite research skills and experience to be able to fulfill this capacity. A ”Protection Cluster – Summary response Plan” elaborates on how information gathered by EAPPI is utilized throughout the UN system, including in the high level UN reporting by the Secretary-General. The document explains that EAPPI will be active in providing “Ongoing submission of incident reports to the SVCG, UN agencies and other relevant actors” and a July 2013 UNICEF situation report adds that EAPPI provides “monthly Check Point Monitoring Logs to the international community.” According to the same report, UNICEF has partnered with EAPPI since May 2013 and by the time of writing the report had already provided “safer and timelier access to schools” to 3,317 children (1,037 girls and 2,280 boys) and 249 teachers. W’iam: a Palestinian NGO that promotes BDS campaigns against Israel, utilizes “apartheid” rhetoric, and seeks to demonize Israel through Christian theology. Dr. Zoughbi Zoughbi, W’iam’s founder and director, has been EAPPI’s Secretary and the Local Programme Coordinator since June 2017. In August 2014, Zoughbi said, referring the 2014 Gaza war, “They started in the West Bank with the story of the 3 disappearing children and until this morning we are not sure what happened with them” (emphasis added). In contrast to Zhoughbi’s retelling, Gilad Shaar, Naftali Fraenkel, and Eyal Yifrach were kidnapped and murdered on June 12, 2014. Their bodies were found on June 18, 2014. National Coalition of Christian Organizations in Palestine (NCCOP): As its name states, NCCOP is a coalition of Christian and Church-related organizations in the West Bank, Gaza, and East Jerusalem. NCCOP organized a ceremonial launching of WCC and PIEF’s “World Week for Peace in Palestine Israel.” The ceremony took place at Wi’am Palestinian Conflict Resolution and Transformation Center and included an introduction to a book on prisoners published by the WCC in cooperation with Addameer and Defense for Children International – Palestine (DCI-P) –Palestinian NGOs with alleged ties to the PFLP. On June 12, 2017, NCCOP issued an open letter to the WCC, in which they asked WCC to, “recognize Israel as an apartheid state; unequivocally condemn the Balfour declaration as unjust, and…speak in support of economic measures that pressure Israel to stop the occupation and go further to support sport, cultural and academic measures against Israel … urging the ending of its occupation, Apartheid and discriminations, and accepts refugees to return to their home land and properties. In response to Israel’s war on BDS, we ask that you intensify that measure” (emphasis added). Association of International Development Agencies (AIDA): active since 1967, AIDA “is a membership body and coordination forum of over 80 international non-governmental and non-profit organizations working in the occupied Palestinian territory.” EAPPI is a member of AIDA, together with several of its National Coordinators including DanChurchAid, HEKS EPER, and Norwegian Church Aid (NCA). 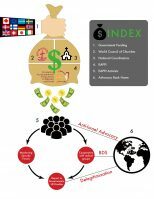 This report is the first comprehensive study of EAPPI’s organizational structure, funding, and goals. The examples discussed above represent only a fraction of the activities in which EAPPI participants partake in Israel and the West Bank and internationally. The positions and statements of WCC officials are entirely incompatible with the organization’s stated desire to improve relations with the State of Israel. NGO Monitor’s research shows that the WCC, the National Coordinators, and EAPPI all play critical roles in delegitimization campaigns against the Israel, including by coordinating these efforts with other organizations in the West Bank. 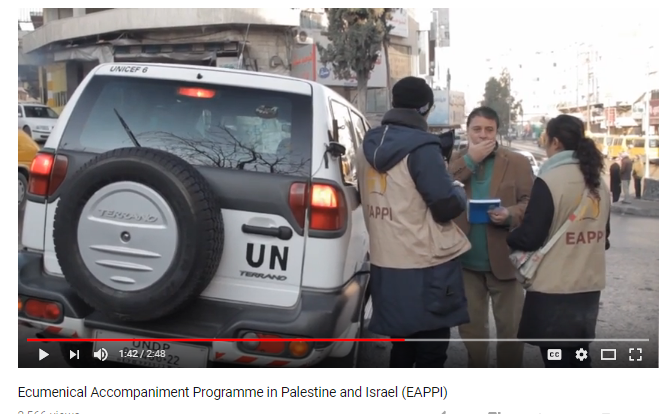 From antisemitic comments from WCC officials through EAPPI’s training programs and international activity, it is clear that EAPPI is a political program unrelated to improving or safeguarding human rights. It is important to note that during the preparation of this report, NGO Monitor researchers corresponded with WCC officials in order to receive answers to questions that arose during the research process. These stemmed from discrepancies between stated goals and activity as well as from a lack of transparency regarding funding. The WCC responses were largely unhelpful in clarifying these issues. See definitions of antisemitism from International Holocaust Remembrance Alliance (IHRA) and in a June 1, 2017 European Parliament resolution. Jeff Halper, co-founder and former director of the Israeli NGO ICAHD, claims to have been one of the founders of EAPPI in Geneva. In 2015, ICAHD was closed due to a court order. The Israeli Registrar of Non-Profits filed an order to dismantle the organization following ICAHD’s failure to report donations from foreign political entities, failure to file annual reports, lack of response to requests made by the Registrar, illegal use of the name of the organization, and the lack of reporting names of board members. The Kairos Palestine document calls for BDS against Israel, denies the Jewish historic connection to Israel in theological terms, and blames Israel alone for the continuation of the conflict. The Kairos document also includes justification of terrorism against Israeli citizens, calling it “legal resistance”: “Some (Palestinian) political parties followed the way of armed resistance. Israel used this as a pretext to accuse the Palestinians of being terrorists and was able to distort the real nature of the conflict, presenting it as an Israeli war against terror, rather than an Israeli occupation faced by Palestinian legal resistance aiming at ending it” (emphasis added). It additionally states that the “roots of ‘terrorism’ are in the human injustice committed and in the evil of the occupation.” The co-author of the Kairos Palestine document, Rifat Odeh Kassis, was EAPPI’s international coordinator and project manager from 2005-2007. Rev. Dr. Owe Boersma, based in Geneva, has been the international coordinator of WCC-EAPPI since September 2016. The position was previously held by Manuel Quintero, who served in the role for eight years. 76% of its funding is provided by the Norwegian Ministry of Foreign Affairs. See also a presentation created by JIC, a presentation created by EAPPI-US, and a presentation created by the WCC. UNICEF spearheads a campaign to have Israel included on a UN blacklist of “grave” vio-lators of children’s rights. This political agenda is a primary facet of UNICEF’s activities relating to Israel, completely inconsistent with its mandate of “child protection” and from its guidelines for neutrality and impartiality.